With the 2016 film The Shallows earning $119m off its $17m budget and 2017’s 47 Metres Down earning $44m from its $5m budget the summer shark movie is back and The Meg is this year’s offering. The stakes here are markedly higher with a hefty $150m budget everything is bigger including The Meg itself a prehistoric 70ft shark skulking about in the sea trench off the Chinese coast. 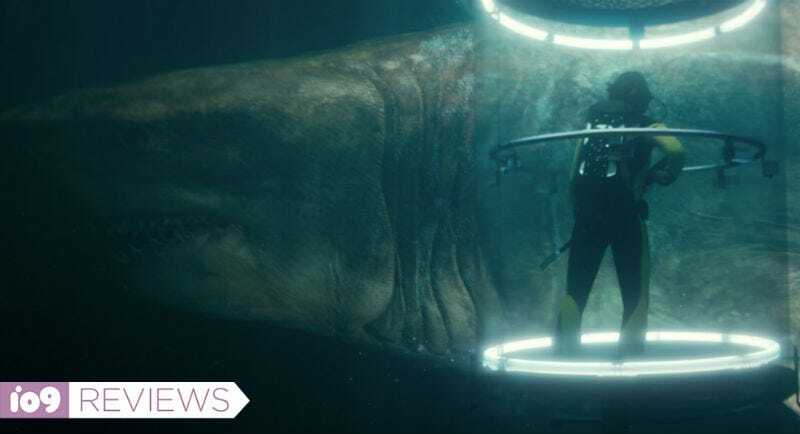 The fact that The Meg is only hinted at in the opening scene where Jonas Taylor (Jason Statham) first encounters the monster is a mark that the film is sticking to the template of Jaws the grandaddy of all shark movies. It’s a template that it rightly sticks to with the shark never fully seen until some way into the film and not before Statham’s ex wife Lori (Jessica McNamee) finds herself trapped in a mini submersible at the bottom of the ocean having been attacked by something big. Summoned from drinking himself into oblivion in a Thai beach bar Jonas is summoned to an ocean exploration rig in the middle of the South Seas to rescue her by miscast comic bad guy Morris (Rainn Wilson) so you just know that he’ll be on the menu when the man munching begins. 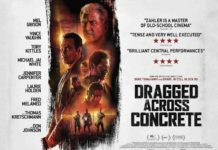 With Statham in the lead role its cast is fleshed out with an international cast of multicultural stereotypes including a stereotypical hyper active motor moth black character DJ (Page Kennedy) as well as several Chinese actors, a Norwegian, an American (Ruby Rose) playing an Australian who is relegated to second fiddle when it comes to leading lady status. That the Meg was largely financed by Chinese money explains the predominance of Chinese actors in leading roles and also why the film is located where it is with a significant chunk of the film set in a heavily populated Chinese beach where the meg, having escaped from his sea bed abode, comes to the surface to start snacking on sun seekers. 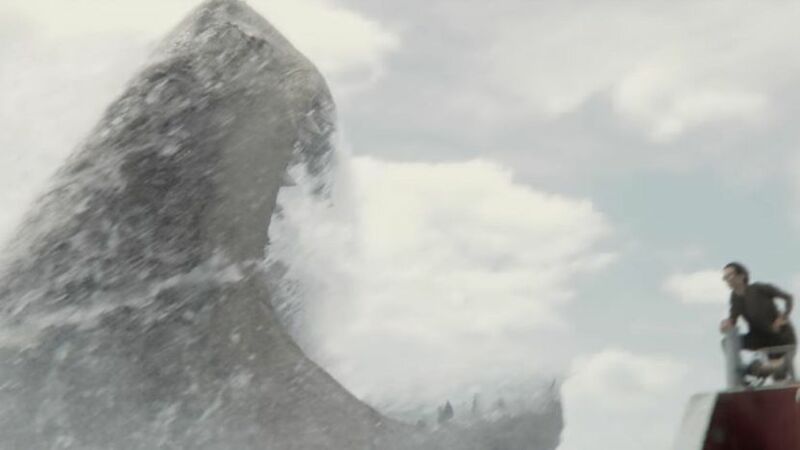 Of course The Meg has not counted on The Stath to save the day with a mano-a-sharko battle though anyone expecting him to punch the shark on the nose will be disappointed but there are some sequences which are not too far removed from that. Director Jon Turteltaub has made the National Treasure films and knows how to handle the action sequences though there’s little suspense to be had here and still 40 years later Jaws s remains untouched as a master class in suspense but The Meg is indebted to that film even going as far as to lift a scene (or is that pay homage) to ‘the Kintner kid’ who goes for a swim when The Meg is on the loose. So with all these modern shark movies much is made of the believability of the shark itself and The Meg here is impressively rendered and the visceral terror of a 7ft gaping mouth hasn’t been seen since the days of the late Reverend Iain Paisley appearing on TV screens. 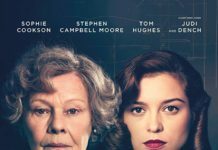 With thrills which are sometimes a little too obviously signposted the script is by the numbers but that doesn’t take away from what is a lightweight but enjoyable romp to end the summer blockbuster season. Based on the book of the same name The Meg is a B-movie with an A-list budget. Not as knowingly funny as the trailer would have you believe and toned down for a 12A this is old fashioned hokum and with these type of movies still proving popular it seems that it hasn’t jumped the shark just yet.